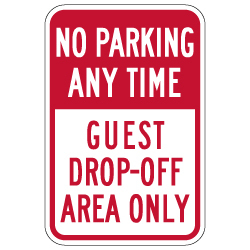 No Parking Any Time Guest Drop-Off Area Only Sign - 12x18 - Reflective Rust-Free Heavy Gauge Aluminum. Clear your hotel guest drop off sections of parked and idle vehicles with our No Parking Any Time Guest Drop-Off Area Only Signs. Sometimes high traffic areas located at the front of your building meant to drop off guests can become overcrowded with parked vehicles. This split sign with red No Parking Any Time header and bottom red text is a great way to get the attention of all nearby drivers. DOUBLE the working life of your No Parking Guest Drop-Off Area Signs by selecting our Protective Overlay Film (POF)! 3M’s high-tech POF protects sign faces against fading caused by the sun and harsh weather—and makes graffiti and sticker defacement damage easy to clear away without harsh abrasives.